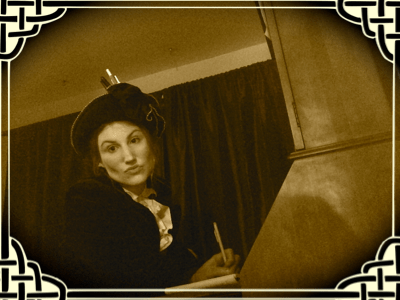 Violet Teasdale, Gentlewoman Journalist, lurked- rather daringly- in the public bar of the Yeoman’s Arms. She did not usually Frequent Drinking Establishments, but she was quite desperately anxious not to miss a minute of News Fit To Print. Violet was a rather single-minded young woman, and for the past three years her mind had been singly focused on making a name for herself as a journalist. She had dreams of being sent to exotic places, of interviewing important people, of working for The Times. For now, Violet Teasdale lived in Great Blister and wrote a weekly advice column for The Blister Examiner. In this column, she answered letters. “Dear Auntie Aggie,” wrote the young women of Great Blister, and it was Violet’s job to reply, and to do so in a way consonant with the rather hidebound morals of the paper’s proprietor. Therefore, her column dispensed Advice that made her gag to re-read and Moral Censure for actions that she frequently felt were rather more deserving of applause. She winced to think of all the lies she told to the young women of Great Blister. Well, she couldn’t help it. It was hard enough to keep her job as it was. Not only was she a woman, she was a woman with a lifetime of training in good manners. These were handicaps enough for any journalist, she reasoned; if she were to add Ethics to the mix, she might as well go get married to Reginald right now. And that Would Not Do. She thought him Very Nice, but Dull. Besides, she’d just received a kind of unacknowledged promotion at the Examiner- they’d let her write up a few local and unimportant events “to fill in some of this blasted blank space” (as her editor had put it). That she had not attended any of these events herself, nor had she had the time to gather the true facts from anyone who had (“I need it in twenty minutes, tops, girl! Tops! Get on it, and the facts be blowed!” as her editor had put it) had bothered her not at all. She felt it gave Increased Scope for Invention. But, even after this momentous event, working for The Times had seemed as far off as ever- until yesterday. Violet Teasdale was not a woman who needed telling twice. It was the Opportunity of a Lifetime. Not only was she likely to be the first Journalist on the scene of this Important Murder, she also had an Important Local Contact, in the form of Aunt Margie. She came to Cadblister Parva, dumped her luggage at Aunt Marge’s, and, finding Marge no-where on the premises, made haste to the Yeoman’s Arms to gather information. Now, Bess was not much of a drinker. For the last couple of days, however, Bess had been a very worried woman, and whiskey sounded just about right. “Ooh, thankee Miss!” Said Bess. “Arr,” agreed Bess. “Terrible hard.” She shook her head. They brooded in silence for a moment on this problem they held in common. “Lord Cadblister,” said Violet, firmly. “Tell all. All you know,” she added, generously. “Have nother whiskey. Me too,” said Violet. “Right.” More whiskey was consumed. “Ah. Why indeed?” Violet nodded sagely. “He wouldn’t have any reason for killing Lord Cadblister, would he?” This was asked with elaborate casualness. Now, Bess was an intelligent woman, and generally she would not confide to a stranger that which she hadn’t dared to tell even her own mother. But she was no more used to whiskey than Violet was, and it had loosened her tongue. Bess prattled on. “Your Alfie- pilfering?” Violet wanted to get this clear. Violet had never been snubbed as suddenly as this. She was a bit at a loss at the abrupt stoppage. She opened her mouth- and the door at the back of the room opened. A man, shorter in stature than the average but with a giant’s swagger and a general’s eye, entered the room. “That’s the Inspector, Miss. From Scotland Yard. Came this morning,” whispered Bess. The man came up to the bar. “Pint, Bess.” He surveyed Violet critically. “And one for the lady,” he added, courteously. Violet accepted the pint. Her head was swimming oddly, and it occurred to her that perhaps a pint would help clear it. She took a big gulp of the stuff. “That’s right,” said the man approvingly. He watched in silence as she gulped more beer. Then he nodded and settled back into his chair. “Now, tell me why you’ve gotten Bess here drunk,” he asked. “What?” Violet took another sip. She did not feel at all well. What would have happened if Violet had not at this point been violently sick must remain one of those irritating unsolved mysteries. For violently sick Violet suddenly was. The man nodded politely to both women and took his pint to a distant table. Bess, who had experience with people being violently sick, got Violet upstairs and into a bed with such swiftness that Violet barely even noticed it happening. “No…” Violet moaned. She knew Doctor Brandwood. She Did Not Want Him To See Her Like This. Besides, he’d tell her aunt. She was certain he would. And Aunt Marge was so unpredictable in her reactions. She might dismiss the thing with a hearty laugh, or she might be Ribald on the subject for the rest of Violet’s life. Or she might even disapprove. Violet couldn’t imagine what Aunt Marge would be like, disapproving, but she was sure it would be dreadful. “Noo…” Violet wailed again. But Bess was gone. “Alone…” Violet wailed, plaintively. “All alone.” Then she fell asleep. Someone was poking her. Violet opened her eyes. Doctor Brandwood stood over her, jabbing her in the shoulder with a sausage-like finger. Sausages. Unhappy thought. Bess was sick again. “Serves you right,” growled Doctor Brandwood. “Stay here and sleep it off. On your side, please. I don’t want you choking yourself. I’ll reserve that pleasure for your aunt.” And Doctor Brandwood was gone. Violet heard him knock at the door of the room next to hers, heard the creak as the door opened. Heard, just as she was on the point of sleep once more, Doctor Brandwood’s voice. What Doctor Brandwood said was, “Hello Richard. Ah, I see you recognize me. Good. Well, don’t just stand there gaping- let me in.” The door closed. Hmm…. who is the strange visitor that the doctor is calling on…. Stephen- thanks so much for stopping by! I’m having a blast with A To Z this year!